We’ve found an exciting new casino which is bound to provide a variety of players with hours of entertainment and not-to-be-missed welcome bonuses and ongoing promotions. Wild Wins Casino only hit our screens in May 2018, yet it is already proving to be another of Nektan Limited’s brilliantly intuitive iGaming playgrounds. GET UP TO £400 FREENew Customer Offer. T&Cs Apply. 18+. Please Gamble Responsibly. Have a wild time at Wild Wins! The site offers so much fun, you won't regret signing up. Just like any other Nektan powered casino, it is an extremely safe and fair platform to play on and is strictly regulated by two of the industries trustworthy authorities, the UK Gambling Commission and the Government of Gibraltar. Continue reading our Wild Wins Casino review to learn more. Its impressive choice of games, numbering over 500, along with its plain yet attractive black and pink theme and impressive bonuses available on both mobile and desktop devices ensure us that this online casino is here to entertain. When logging on to this website, you are welcomed by an eye-pleasing interface which is very easy to use. The online casino is not afraid to show off its great bonuses and promotions, which rule the homepage. Netkan Limited is a leading international gaming solutions and services provider which is recognised as being at the forefront of innovation in mobile gaming, and this new baby of theirs does not disappoint. Look at our Cheeky Riches review to see another great site from the same provider. Take a read through the following sections to understand more as to why this online casino should be one we all experience, as well as getting the lowdown on our Wild Wins Casino bonus codes and promo codes. Sign up and create a new account with the site today and take full advantage of their Wild Wins Casino bonus codes in April 2019 for new players. 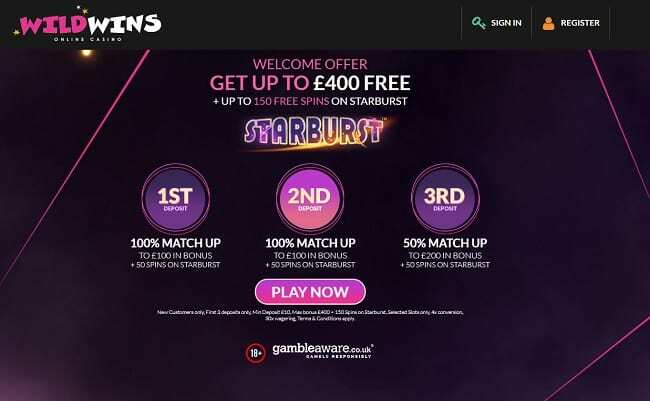 Not only can you receive up to £400 in bonus cash, but you will also receive up to 150 bonus spins to play on Starburst, one of the most popular slots out there! This main welcome bonus package spreads itself out over your first three deposits. Once you have registered for a new player account, you are ready to make your first deposit, which needs to be a minimum of £10. If you deposit £100 you will receive £100 in bonus plus your 50 spins on Starburst. The second deposit you make will also have a 100% match up to £100 in bonus, so feel free to take full advantage of this one too and deposit £100! Your third deposit has a 50% match up to £200 in bonus. Your second and third deposits also have 50 spins on Starburst rewarded too. There is a 30x wagering requirement on all bonuses, which may seem a little steep but is actually quite low compared to similar online casinos welcome bonuses. Wild Wins makes sure the fun does not stop there. There is the opportunity to use their Booster Bonus 50 promotion whereby you can deposit any amount up to £100 and receive a 50% match on it. To be eligible for this promotion you must deposit a minimum of £10 and the promotion is only valid for your first deposit on that day. If you are a bit of a football fanatic and want to celebrate the Champions Cup in style, then take a look at the Free Spins Frenzy promotion. Here you can make a deposit of £20 and receive 20 bonus spins or deposit £40 for 50 bonus spins. Again, there is a wagering requirement for this of 30x and the free spins are only valid on the game Champions Cup. The casino has just launched its brand new and pretty impressive VIP scheme, offering rewards, prizes and bonuses to loyal players. Once you are a VIP member here, you are one for the rest of your life. The casino has a dedicated VIP team, including your very own personal account manager, which acts to ensure all loyal players have the best gaming experience possible. You will also have access to exclusive promotions and reloads, along with faster withdrawal times, higher deposit limits and special gifts. To qualify for this exclusive membership, you will have to deposit at least £2,000. There are several tiers within the membership, which offer different benefits depending on the level of VIP. Silver level is what you can begin with and once you have deposited over £20,000 you are then eligible for the Elite membership. Do not let the fact that Wild Wins is young affect your judgement on its selection of games. It has, in fact, one of the most comprehensive game catalogues that we have seen in a long time. You are sure to find what you are looking for here, whether slots, table games or live dealer games. From fan favourites such as Starburst, Gonzo’s Quest, Cleopatra online slot, Neon Jungle, Bonanza and Foxin Wins, there is a huge selection of high-quality video slots. There are also some of the best live dealer games available here including Auto Roulette, Oasis Poker, Dream Catcher and Blackjack Classic. If you are a gamer that enjoys playing against other real players from all corners of the world, then this is a section of the website that you must check out. Last but not least, check out the jackpot games such as The Pig Wizard and Golden Goddess which may result in you enjoying the biggest win of your life! All games are well organized into categories and the search option allows you to filter the search by type, provider or frequency and value of wins. There is a great FAQ section and support team that are placed to help you resolve any issues, problems or complaints. They can be contacted using email, live chat, or live help. Just remember that the phone line and live chat are only open between 08:00 and 00:00. However, e-mail is still pretty speedy, and you will most likely receive a reply to an email within 24 hours. They are companies that have been in the industry for such a long time, they know what their players want, and we can safely rely on them to bring us the best quality and exciting games including new releases and innovative ideas as soon as they are available. Another brand from the Nektan network is Bonzo Spins so be sure to check this out too. It is thanks to the list of software providers this casino has enlisted that it has a rich selection of games and we are certain that this list will keep growing and growing over the coming years, especially when the providers release brand new ideas. You can use these at any time to make deposits or withdraw your winnings. To make a deposit, you need to make sure you are depositing a minimum of £10 but withdrawal amounts are a minimum of £20. Winning funds can be withdrawn at up to £2000 per day and once you request a withdrawal it may take up to 3 working days due to a safety process. The Wild Wins mobile site is fully optimised to work on any screen, whether desktop, tablet or smartphone. You do not need to install an app or download a program, simply open your mobile browser and type in the website address. The running of games via a mobile device is just as effortless as it is on a desktop version, no unwanted pauses or hesitation from the game, just great smooth graphics and fast loading. Loads of mobile-friendly sites online are now available for players who prefer a more versatile experience. The site has not yet shown any major downfalls in our Wild Wins Casino review and is one that should be visited by every online casino enthusiast. Yes, there is nothing special about its appearance or other features, but it does have a huge collection of slot games, as well as alternative games and of course its long list of promotions and bonuses. We can be guaranteed a smooth gaming experience thanks to the Nektan powered platform with gaming content that we are used to. It has a very nice feel to the site, and it appears that there is no trouble finding the games that players are looking for. Navigation is easy, and the categories help divide up the comprehensive selection of games available. With the impressive Wild Wins Casino bonus codes and the great game catalogue, you cannot really go wrong with this newcomer.